Before proceeding, you’ll obviously want to go grab the updated libraries themselves. For the core jQuery library, I suggest using the minified version. Because images are also part of jQuery Mobile, I recommend grabbing the zipped version of the framework. After you download and unzip the folder, you’ll find a full version of the css and js files. I recommend using the minified versions, so go ahead and delete the full versions of the files (ie, they don’t have “.min” in their names). Inside this folder, you’ll find the jquery-mobile folder. If you want to backup the folder, feel free. 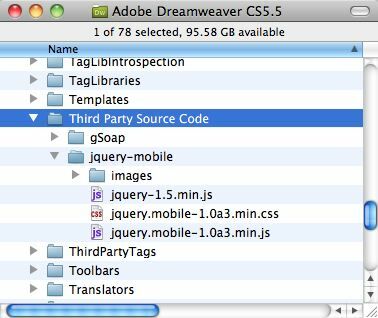 None of the sites that you have worked on previously are reliant on these files, as Dreamweaver makes a local copy in each site you create (if you are not using the CDN versions of the Mobile Starter Pages – which we will talk about later). 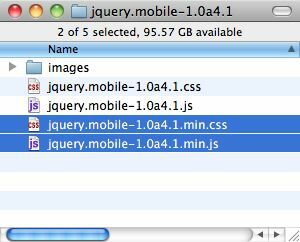 Replace the two jquery-mobile files (css and js) with your newly downloaded files. Replace the entire images folder as well. Finally, replace the jquery-1.5.min.js file with your jquery-1.6.1.min.js file (or whatever you named it). One last step and your update is complete. When you choose to create a new file from the New Document dialog, Dreamweaver makes a copy of the selected file from the Configuration folder and places it in your site file. The Mobile Starter layouts (New Document > Page from Sample > Mobile Starters) are located in Configuration > BuiltIn > Mobile Starters. There are 3 pages – two of which reference the files that you have now deleted, jQueryMobileLocalMultiPage.htm and jQueryMobilePhoneGapMultiPage.htm. Finally, if you want to change the CDN version, it points to the jquery repository online, simply update jQueryMobileMultiPage.htm to point to the location of the CDN versions of the files. Man, I wonder who the total stud was that built out Dreamweaver extensibility. I mostly went to the University of Greg Rewis! -Thanks a lot. Thanks for this info. I just found out, that in the dialog, that appears, if one inserts a jQuery page into a document (from the panel) there is a possibility to change the source of the folder where the jQuery files are loaded. So I just tried this. When I made a new site, it didn’t copy the files over. It referenced them via a file. Technically it still works, but it should have copied them into the site, right? Sorry – ignore me. I had to save it to the site first. Duh. what exactly is the difference between the DWCS5.5/Configurations and the DWCS5.5/de-DE/Configurations settings? Where’s the priority set? Or do I need to update both of them every time? The files in de-DE are just language specific items and do not contain anything that you manually need to update. Hmmmmm … I just followed your directive exactly and when I create a new “local” page and save, all of the new files go over just fine, but when I change themes or navigate, the “back” button is not there. I wonder what I am doing wrong? Any ideas? By the way, your directions are perfectly clear, so that is not the issue. Thanks in advance. PS: themes seem to have no effect with the new files. Thanks again. You are wonderful … thanks for the quick reply. I thought I was doing something wrong! 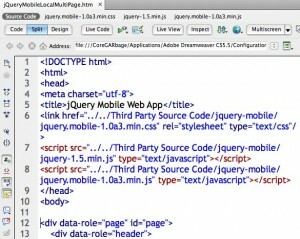 Bottom line though: I LOVE jQuery Mobile. so, i guess that every time there is an update y should dig in into dreamweaver cs5.5? or is there a way of.. i dont know.. simply updating the app or updating an extension or so? greetings, nice max 2011 from mobile to web app in 60 sec presentation. Brilliant, many thanks for posting. Quick, easy and worked perfectly. And thanks for the Back button post. New to jquery and the info was just what I needed, even though I didn’t know it. Now back to DW, but first a beer. Hello, i can`t save the files jQueryMobileLocalMultiPage.htm in Dreamweaver. It is write protect i think. I can`t delete the write protect from the folder. but app performance so slow, very slow ..
You are one and you do it: ROCK ! Really enjoyed your presentation and Stephanie’s at the New Web meeting the other week! Thanks for the config tips. I was wondering what to do since they just rolled out jquery mobile 1.0. How about the phonegap.js? They’re up to 1.2.0. I looked to see if it had a version number inside the code. I could just swap it out but I don’t know if that’ll create problems compiling. Any advice? Thanks for this post, it is very helpful! Any idea if it is the ~same~ sort of process to update Phonegap? A little off the jQuery topic but still relevant to extensions. Any idea of when or how the Phonegap integration with Phonegap 1.2 and latest Xcode will be fixed? At present I can’t get past Dreamweaver and get a successful build and emulate for either Android or iOS (although I have found something to try for Android which I will do shortly). Also cannot save over the jQueryMobileLocalMultiPage.htm files. Tried changing permissions / read only etc. but got nowhere – am I being stupid? P.S. The Background behind this post (that enables you to see the text) is not shown in IE9. I’ve updated jQuery, jQuery mobile, and PhoneGap to their latest versions (as of this writing jQuery 1.7.1 and jQuery-Mobile 1.0 and PhoneGap 1.3.0) however there seems to be a conflict somewhere. I create a new PhoneGap app from a template and when I go to input a jQuery Mobile slider, the slider does not respond to any mouse/keyboard input. I commented out each of the lines in the new document and it fixes the sliding but then loses the theme in the mobile-1.0.css file so there must be a conflict between the two files. Any ideas how to fix this issue? As a test, I reverted to the jQuery and jQuery Mobile js/css files that were initially installed with Dreamweaver and it seems to have fixed the issue so there’s clearly a conflict between the two files when updating them. These versions are out of date. JQuery Mobile 1.0 is only tested against JQuery 1.6.4. JQuery 1.7.x will be supported in JQuery Mobile 1.1. I don’t believe PhoneGap has any dependencies with JQuery or JQuery Mobile, so you should be ok with it, but you never know until you test. If have an update for your great tutorial, not sure anybody already mentioned this in the comments. Also i’m not sure if this aplies also to CS5.5, because i use CS6. Here it is: If you use a localized version of Dreamweaver, you also have to update the files in the Configuration folder (both Third Party Source Code and BuiltIn) in your “Country Code Folder”. For Germany/German this is de_DE. Otherwise the templates won’t update. 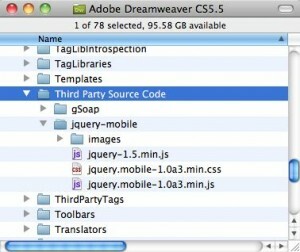 I have updated my Dreamweaver CS6 to jquery 1.7.2 and jquery mobile to 1.1.1. Following all the great directions above, it updated without a hitch and corrected many bugs I found after deploying my app. One big problem remains. The new Jquery Mobile Swatches dialog which worked great in 1.6.4 and 1.0 no longer works. Any help would be greatly appreciated. Excellent work my fellow internetter! You shall be rewarded…tomorrow! Yes Sascha K., thanks for pointing this out on May 9th, 2012 at 1:30 am. We do have to update multiple locations on the files. Cheers, this worked a treat.. Ignore the DOUCHE BAGS that can’t wait to pounce on anything on the net with their “recommendations”… Some people are more interested in criticising other peoples work than making any real effort themselves. Again nice work and thank you! Neil – I had the same issue with the Swatches but I found the fix. In addition to the instructions above you must also update the file JQuerySwatch.html located in C:\Program Files (x86)\Adobe\Adobe Dreamweaver CS6\configuration\jQuerySwatch\. Look for the line that refers to the jQuery library and update as follows – script src=”../Third Party Source Code/jquery-mobile/jquery-1.8.2.min.js”. Refresh the swatch and your swatches should be back. Brilliant. It just hit the spot. Thanks for the info. There should be any advise like this in DW-Help. This works great for when you create a page from the mobile samples. But, how do you fix it so that the insert->jQuery Mobile->Page uses the updated scripts as well? When I try it, the dialog box that pops up still refers to the older scripts. 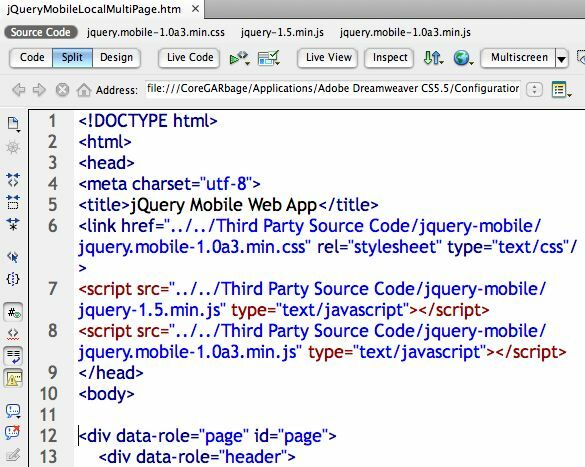 I have updated my jquery mobile files as per the steps you gave..
now i face a small problem..
there used to come icons when i was using older version of jquery mobile but after updating i dont see any icons..
can you help me out with this issue..
« Dreamweaver CS5.5 — Wickedly Evolved!